3rd time's a charm… The first time I hiked Birthday, it the final peak to finish when I tried to do all 6 peaks for this challenge in a week back in June. 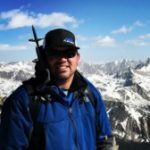 I felt successful as I was walked back to North Cottonwood Creek Trailhead but later that evening looking at my GPS route I realized, I summited the wrong peak. I accidentally stayed on Kroenke Lake Trail for too long and figured I would hike over to Birthday but unfortunately I didn't hike over far enough and climbed a similar like unnamed peak. I knew I had to go back and do it for real another time. One month later, weather called out 20% rain at 3PM, not bad odds. But only 30 minutes from reaching Birthday Peak summit, a huge storm at noon rolled in and I just knew I had to call it and make our way back down. Thankfully we turned back because not 5 minutes later going down, loud thunder and dime sized hail started to pour down. It was small hail but still hurt like crazy and filled the trail enough to look like it snowed. One month later, 3rd attempt (my wife said final attempt, I better get it). Weather was perfect! Thank goodness because yes even with a GPS watch we walked up the wrong valley that takes you up by Mt. Harvard. This is the wrong valley!!! This valley had so many downed trees and much worse bushwhack than the suggested route. Luckily, we knew we made the mistake, traversed over and got on the right path towards B Day peak. Another hour or so later, we summited! So happy to get it done and we came down the right path thank goodness. I mean I believe I am a experienced hiker but perhaps that's what got me. Thinking I have been on that mountain twice already made me stubborn enough to not bring print out maps or program the GPS route in my watch. Getting off on the wrong path once again taught me something important that I can really take away this time. And… now I can officially say I have completed CO's Six-Pack of Peaks Challenge! Congratulations on completing the Colorado challenge, @chris-mcmillen! You are one of the few to bag all six peaks.